business owner working out of his Staten Island studio. 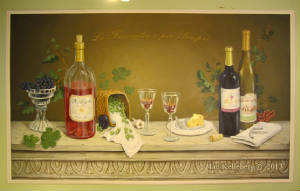 He is the lead artist and works directly with the customer, insuring that all their needs are met. We consider every aspect from, who is the target audience, to how to properly protect and preserve the mural. Ian makes sure that the murals he makes are of only the highest standards. Ian works with a variety of clients, both in residential and commercial spaces. Murals can be interior or exterior, and come in any shape or size. Above: A dining room mural framed by molding. Below: a beautiful garden scene on a curved bathrm wall. Whether your walking into a beautiful secluded garden or just passing by an ambient dining room setting, you can have your very own mural create the mood and atmosphere you yearn for. 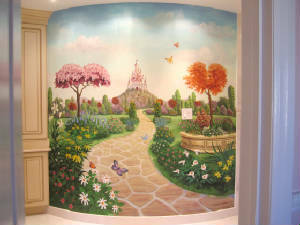 Create your own surroundings with a mural and transform your room today! 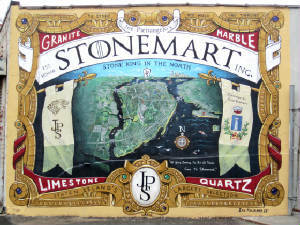 Above: an exterior mural advertising for a local business. 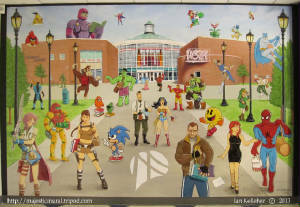 Below: a mural for a local college's game room. Ian's murals can look great for advertising your business. Mural paintings in your waiting room or public space can tell your story and spark interest from anyone viewing it. The artist can create that one-of-a-kind look your looking for.